The element that immediately catches the eye in the new central on the river Iller in Kempten is the dynamic and elegant shape. The "shell" of sculptural form, almost 100 meters long, brings to mind many associations of ideas: from whales to ships, to smooth stones. The plant replaces a building from the 1950s and supplies energy to around 4,000 households, with a capacity estimated at around 14 gigawatts per year. When calling the design competition for the structure, the client Allgäuer Überlandwerk (AÜW) Kempten requested a project that would harmonize with the existing protected buildings, including the former Rosenau spinning mill. The result is a building that has won several awards (the German architecture prize 2011, the German architecture prize in 2010, the German prize for industrial buildings 2010) and has reached the final of the Liechtenstein International Construction Award sustainable in the Alps 2010. 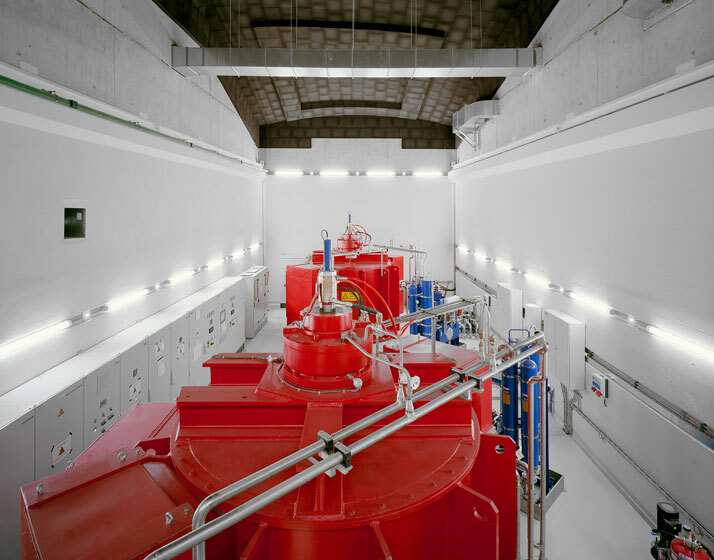 The idea conceived by the architecture firm Becker Architekten provided for the connection of the two ends, that is the central unit (complete with generators and transformer) and the flow limiting valve, by means of a continuous casting. More or less half its length, the latter passes under the arch of the historic steel bridge crossed by cables. Despite the overall dimensions, the architects wanted to give life to a highly differentiated organic formable, on the one hand, to merge with the surrounding environment, but on the other, to be perceived as an independent element thanks to its architecture. When the engineers at Konstruktionsgruppe Bauen AG (based in Kempten) became part of the project, a decision had not yet been made on the materials. At the end, a concrete structure was chosen to allow the realization of the organic form that would have enclosed the plant. Initially, the engineers used manual sketches to establish the points where the structure could be supported by existing technical installations. The "shell" has been divided into six sections: first to provide the expansion joints required by the thermal conditions, but also because the roof supports had to be fixed at some points and movable in others. In the next phase, engineers developed a ribbed concrete structure. Besides having to be in harmony with the image as a whole, it was necessary that the structure could be divided into six segments. Allplan Engineering was then used to create concrete "shell" models with a high level of geometric detail, to be used as a basis for the design of the reinforcement and of the enclosure itself. The result is a monolithic concrete roof made of curved arched ribs, curved walls and arched roof surfaces. 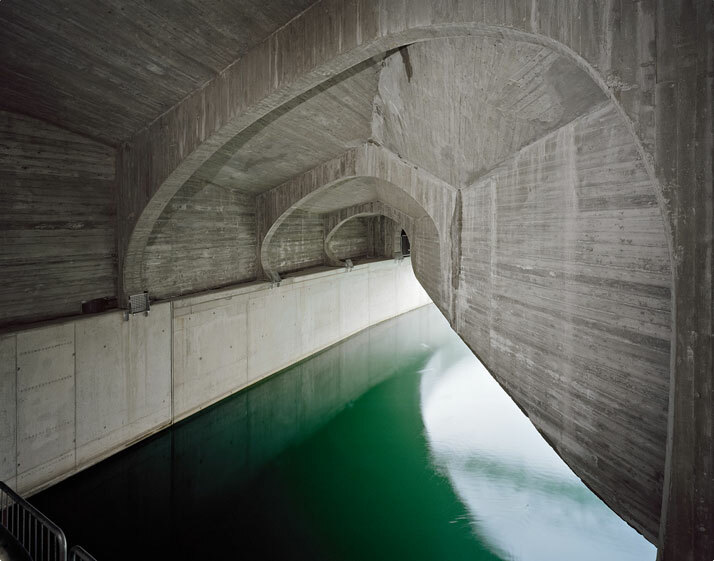 "The organic-shaped shell of the hydroelectric plant was built with a very high level of detail with Allplan Engineering and represented the optimal starting point for the enclosure and armor boards"
The large span free of arched ribs measures 9.3 meters, with concrete surfaces between 20 and 25 cm thick. 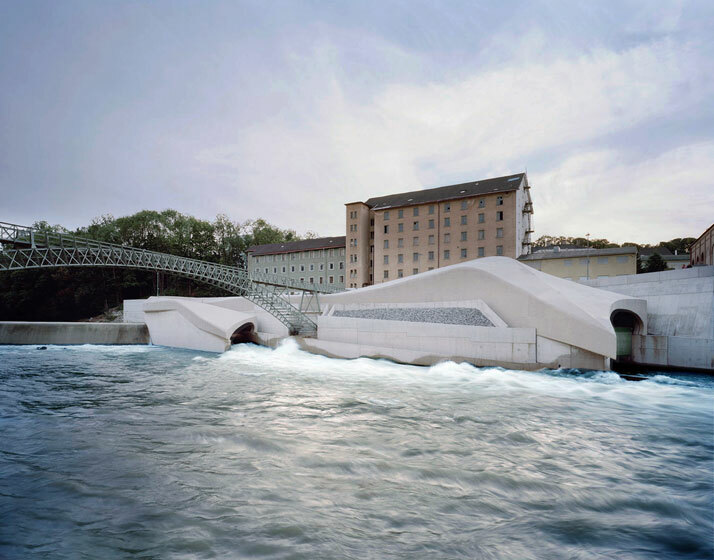 The hydroelectric plant on the Iller is a building that, from an aesthetic point of view, enriches the environment rather than impoverishing it. Among other things, it, therefore, contributes to generating support for electricity from renewable energy. 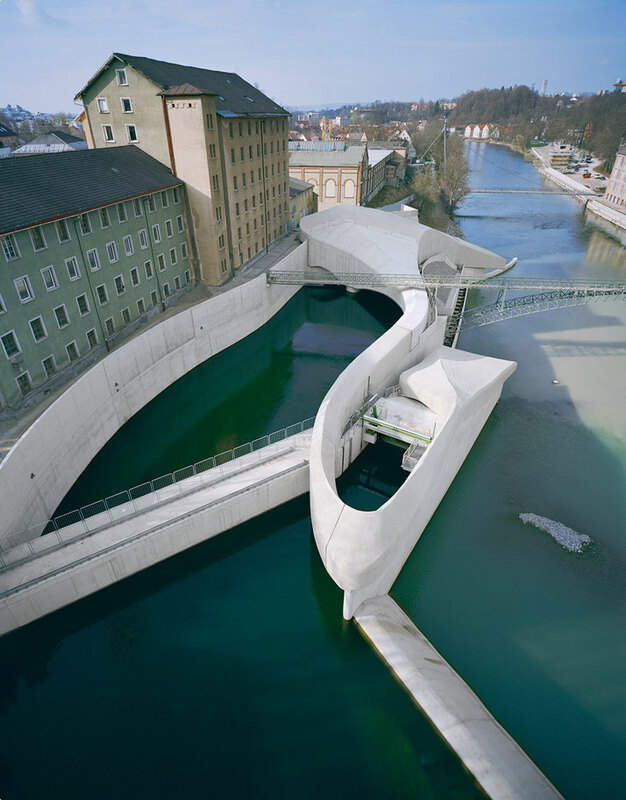 Also part of the hydroelectric field is an outfit accessible through a cycle-pedestrian path that runs uninterruptedly along the river, from the old spinning mill to the new plant, passing through the extraordinary interiors with very high ceilings, with concrete ribs, where it seems to stay in a modern style cathedral. The Konstruktionsgruppe Bauen AG studio in Kempten covers the entire design range, such as bridge and infrastructure construction, structural design and verification and building management, both for new buildings and for work on existing structures. The range of services is complemented by expert advice and building inspections in the areas of bridge construction and structural engineering. In the field of structural engineering design and industrial construction, Konstruktionsgruppe Bauen deals with all issues related to structural analysis, construction and building management in order to develop economically feasible solutions with high design quality.